Celebrity's heavy focus on dining -- the line tries to hit the trends that you find in restaurants on land -- means that there's an abundance of restaurant options. The problem is, you have to pay for many of them. If you're in a standard cabin, the only restaurants without fees are the Silhouette main dining room, the Oceanview Cafe buffet, some items at the AquaSpa Cafe and the Mast Grill. Blu and Luminae are only for AquaClass and suite passengers, respectively. Specialty restaurant dining is popular on this ship, and packages are available for bundles of three meals minimum. Among these extra-fee options, the Italian steakhouse Tuscan Grille earns raves, as do the a la carte choices of Sushi on Five. You'll want reservations for specialty dining. 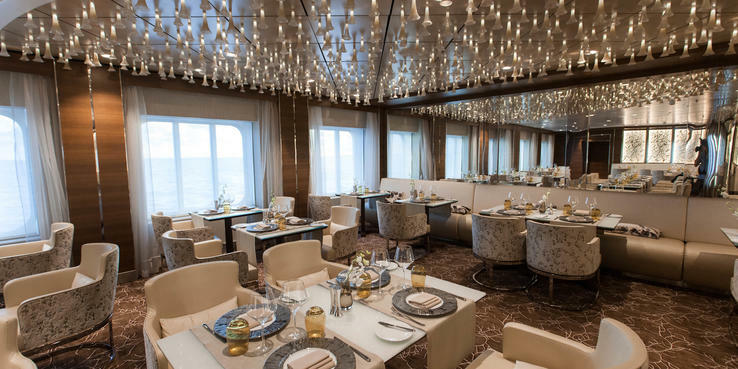 As the main restaurant, Silhouette Dining Room -- with lofty ceilings and numerous table configurations -- offers passengers a choice of two set meal times: early (about 6 p.m.) or late (8:30 p.m.). Those who prefer flexibility can opt for Celebrity Select Dining, which lets them dine any time between 5:30 p.m. and 9:15 p.m. Passengers choosing the flex dining option can pre-reserve space online or onboard or walk in during the allotted hours and wait for a space to open up (rarely more than a few minutes). Breakfast is open seating daily with standard items served. Lunch takes place here on port days only, with soups, salads, hot entrees and grilled items. Dinner menus are arranged in the traditional manner: appetizers, soups and salads followed by entrees and then desserts and cheese. Quality ingredients cooked and presented well make the main dining room experience consistently enjoyable. Expect a varied menu that changes regularly with the basics -- red meat, poultry, seafood and vegetarian dishes -- covered. If nothing on the rotating menu suffices, there are "always available" choices. Different wines are featured on the menu each day, and a sommelier will make his or her way around to take drink orders or make recommendations. Exclusively for suite passengers, Luminae is an open-seating, modern dining room serving dishes made from only the best ingredients onboard -- think dashes of truffle and a dedicated dessert cart. The restaurant is also rolling out a three-course menu by celebrity chef Daniel Boulud that will be offered nightly, in addition to the regular menu. Featuring seasonal fare in a soothing venue, Blu is the dedicated open-seating restaurant for AquaClass passengers. It serves dishes that focus on fresh, regional ingredients like local catches and seasonal vegetables. AquaSpa Cafe, in the adults-only Solarium, serves healthier fare (think small salads) for breakfast and lunch. The cafe also offers Greek yogurt parfaits, although those cost extra. A casual eatery, Oceanview Cafe serves food until 1 a.m. It functions as a multistation buffet for breakfast and lunch, and an open-seating, casual buffet alternative to the main dining room for dinner. Oceanview gives passengers the option to plate up hot entrees, pizza and pasta (including gluten-free), sushi, Indian curries, sandwiches, extensive salad offerings, ice cream and late-night snacks, all without additional charge. The choice makes it one of the best in big-ship cruising that we've encountered. In the morning, you'll find made-to-order omelets and eggs Benedict, yogurt, fresh fruit and pastries among the offerings. Lunch is a mix of hot items, a full salad bar, sandwiches, cold cuts and vegetables. Dinner includes themed entrees, along with a carving station and plenty of vegetarian dishes, plus desserts and ice cream. The best feature, by far, is the sunny, open-air deck situated at the aft section of the restaurant. This casual grill has hamburgers, veggie burgers, turkey burgers, hot dogs and fries, free of charge. The food is mediocre, but it's good for a quick lunch or snack in between meals. The elegant French-Continental Murano serves luxuries like lobster cooked tableside, chateaubriand for two or a traditional French cheese plate and a custom wine menu; it's a romantic spot for special occasions. Vegetarian options like porcini and morel risotto are available. A lunch is available on a sea day once per cruise with a scaled-down version of the dinner menu. Tuscan Grille offers a range of steaks as well as Italian dishes and pastas, along with a nice wine menu and selection of Italian cocktails. The antipasti, which serves two to four people, is not to be missed. Ask to be seated by the windows when you make your reservation; the spectacular views of the wake make the meal all the more special. Tuscan Grille hosts lunch at least once per cruise, on a sea day, with a menu that is a scaled-down version of the dinner menu. Choose from Thai soups and curries or Chinese char siu pork at pan-Asian Silk Harvest. The menu is much lighter than the other specialty restaurants, and the space is also much smaller. If you're not sure what to try, order family style and split entrees. A drink list includes sakes and beers from across the Asian continent. A scaled-down lunch might be offered during your cruise on a sea day. A dining event called Silk 'n' Soul ($79 per person) is held once per cruise and offers a tasting of various dishes from across Vietnam, Thailand, China and Japan, and includes a Champagne cocktail and live music; reservations are required. One of the best-kept secrets onboard, Sushi on Five has an excellent selection of hot pots, noodles and sushi at reasonable prices. A fun bonus is that Sushi on Five provides to-go lunch boxes for, say, a picnic on the lawn, or delivery right to your stateroom. We regularly saw 20 percent off total bill promotions. Cafe al Bacio is the place to see and be seen during the day. Patrons sip for-fee espresso drinks and pots of specialty teas with their complimentary pastries from gorgeous yellow high-back armchairs. The desserts here are seriously good with offerings like berry tarts, German chocolate cake, Nutella croissants and even sugar-free and gluten-free cookies. The Gelateria across the way charges just a few dollars for gelato in a waffle cup. There's also a menu of spiked coffees and for-fee dessert items like a gelato sandwich or sundae. Gastrobar is the ship's home for craft beer and comfort food. A la carte small and large plates dish up elevated pub food like truffle fries or pork buns, plus flatbreads. Gastro opens at 4 p.m. on most days but is open for lunch at noon on sea days. On those days, it's a casual place to grab a burger and a beer and watch the afternoon game. Held in Murano once per cruise, Chef's Table is a multicourse culinary experience, paired with wine, guest starring the head chef onboard.